Mljet is 23 miles from Dubrovnik and is the southernmost of the larger islands; it covers an area of 62 square miles (100 square km). Over two-thirds of the island is covered by forest with the western half of the island declared a National Park. Visitors must pay an entrance fee for the park, and adhere to certain rules. The main places on Mljet are Sobra, Pomena, which probably has the most tourist facilities, Polace and Govedjari. The Lonely Planet guidebook calls it “the most seductive island in the Adriatic”. Prince Charles has visited the island twice and was enchanted by its beauty on his visits. 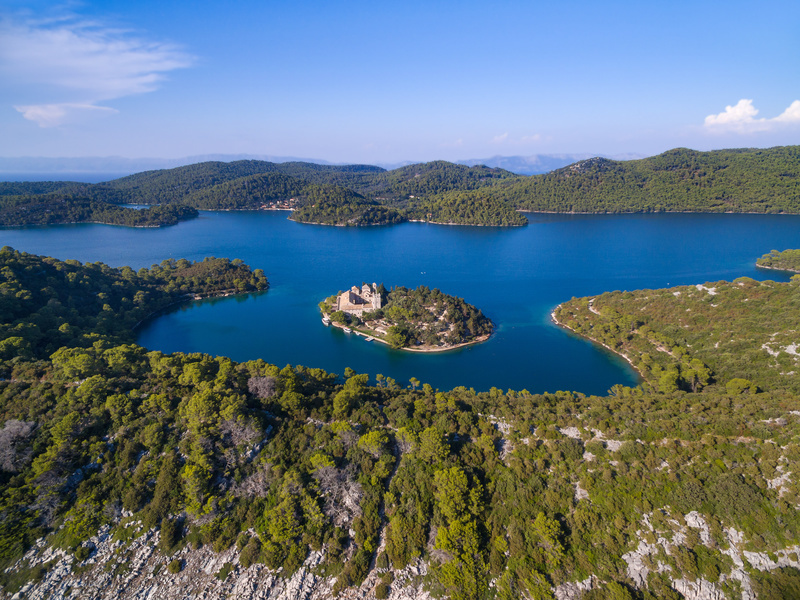 Mljet is famous for the lakes on the island – Veliko Jezero and Malo Jezero (Big Lake and Small Lake) and the abandoned 12th century (at least originally – it has been rebuilt over the years) Benedictine monastery that is located on an island in the middle of Veliko Jezero. (An island on an island!) Enquire locally for boat trips to the island. One of the nicest things to do on Mljet is to hire a bike and explore this peaceful and lush island via its many paths. The majority of the other islands featured in this section have pretty straightforward histories. How’s about this for something different? According to legend, Mljet is the beautiful island of Ogygia where the nymph Calypso kept Odysseus captive for seven years. The ancient name for the island is Melitta, which comes from the Greek melitte nesos, meaning honey isle. Lovely! The island became part of the Republic of Dubrovnik in 1345, under whose control it remained until 1808 before becoming French, then Austrian. It became part of Yugoslavia in 1918, and was part of the Croatia that declared independence in 1991. Dubrovnik to Sobra and Polace: There’s a year-round daily catamaran service, run by G & V Line, from Dubrovnik to Sobra and Polace on the island of Mljet. Journey time is about an hour, and some boats sail via the island of Sipan. In July and August – some services also sail on from Mljet to the island of Korcula, whilst in the winter months the catamaran only sails to Sobra. Dubrovnik to Sobra: Kapetan Luka have a catamaran service from Dubrovnik to Sobra that then sails to Korcula, Makarska, Bol on Brac and Split. This runs daily from mid June to mid September. Dubrovnik to Pomena: Kapetan Luka have a catamaran service that runs from Dubrovnik to Pomena, travelling on to Korcula, Hvar Town and Milna on Brac. This service runs from end of April to the end of October, daily from the end of May to mid October. 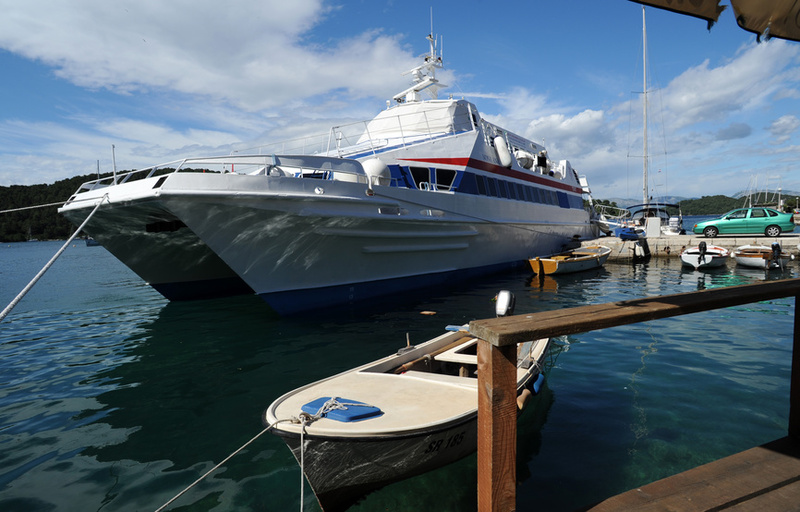 The above mentioned Kapetan Luka catamarans can be used to travel from Split to Sobra or Pomena. You can likewise also use them to travel from Brac (Bol or Milna), Hvar Town, Makarska. Kapetan Luka have two catamarans that can be used to sail from Korcula to Mljet. One sails daily from mid-June to mid-September, the other from the end of April to the end of October (daily only from the end of May to mid October). The G & V Line catamaran can be used to sail from Korcula to Mljet (July & August only). Peljesac Peninsula (Prapratno) to Sobra: Jadrolinija have a car ferry service from Prapratno on the mainland to Sobra; this ferry runs several times a day and has a journey time of 45 minutes. This is the only option available for reaching the island of Mljet if you have your own car. 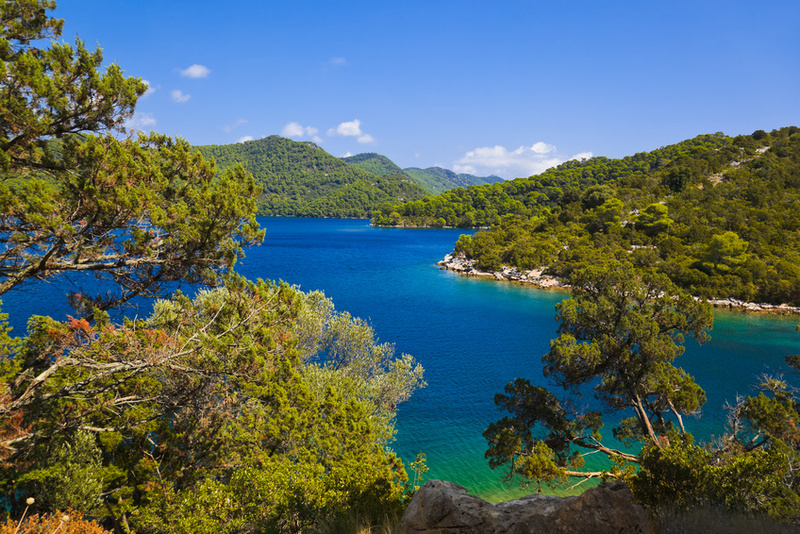 The island of Mljet is easy to reach on a day trip from Dubrovnik or Korcula. Buses on Mljet will take you around the island. There’s a bus that goes from Sobra to Pomena (via Polace and Goverdjari) on the west of the island, and another from Sobra to Saplunara (via Prozura and Korita) on the east of the island. These routes aren’t all that frequent so enquire locally upon arrival for bus schedules. Taxis also exist on Mljet to take you where you’re going. There is only one hotel on the island, the Hotel Odisej, however private accommodation is also available. See our page on Accommodation on Mljet.